Diamond Dazzle is the vivid new 3-Reel classic slot featuring a plethora of prismatic precious stones seemingly floating through space. These intricate icons include a ruby triangle, citrine square, emerald pentagon, sapphire hexagon, amethyst octagon, onyx star, as well as small, medium, and large diamonds. These glitzy gems will sparkle and shimmer when struck on the single payline of this stylish slot. Helping you win along the way are multi-symbol payouts and scatter wins! The game is fantastic in it’s simple and easy gameplay, engaging soundtrack and colorful display. 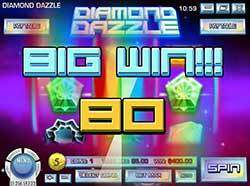 Play Diamond Dazzle for real money at Gibson Casino and get $25 Free. USA players welcome!